I know I promised more South African food Tuesday when I posted my biltong, so here you go. First, we have a delicious curried beef casserole called bobotie (pronounced “buhbootee”). Bobotie is associated with South Africa generally, but it was originally a Cape Malay dish. When I was in South African this summer (with my dad, stepmom, and stepsisters), we went for a family lunch at a restaurant in the Bo Kaap – the Malay section of Cape Town. The place was pretty slow at lunchtime, so the owner sat down with us and started telling us about his people’s history: the ancestors of the modern Cape Malay community, who today observe Islam, were brought as slaves from Indonesia and Southeast Asia. These colonial connections actually often appear in old cookbooks: my copy of Mrs. Beeton’s includes a section on “South African Cookery” and a recipe for bobotie. 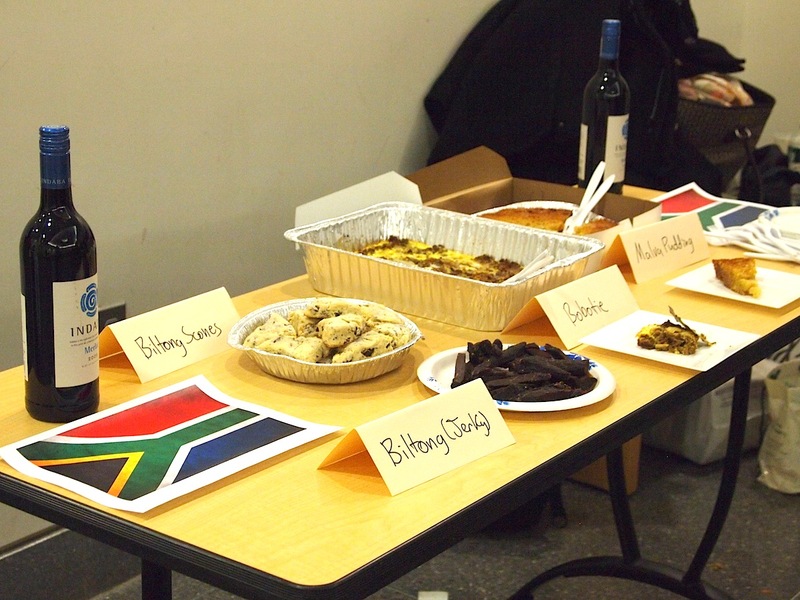 Malva pudding is an Afrikaner (Cape Dutch) dessert, so we have a few South African ethnic groups reflected here. I’m still kicking myself for not serving this with custard or ice cream. I was running too late to pick up some Haagen Dazs, and the pudding tasted amazing on its own; a little vanilla, though, really takes it to the next level. Enough talk. Let’s have some recipes! The bobotie is a family recipe. 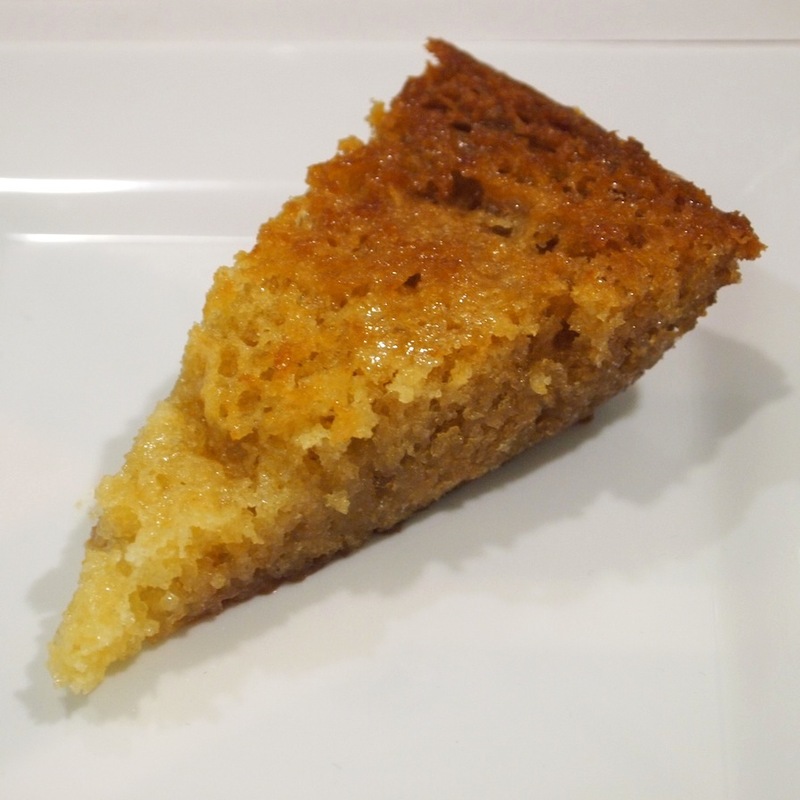 The malva pudding is adapted from a recipe by Myrna Rosen, a popular South African cookbook author. 1. Preheat the oven to 350 degrees. Grease a 9″x13″ pan. Soak the bread in the milk then squeeze it out, adding the squeezed-out milk back into the original cup; if you now have less than a whole cup, top it up. Add the eggs and whisk just until mixed. 2. Saute the onions in the vegetable oil over medium heat until they start to turn translucent. Add the spices (not the bay leaves), nuts, chutney, and raisins, and cook for about 30 seconds. Add the meat and bread and cook, stirring, for a minute or two just until the beef starts to brown. 3. Turn the meat into the prepared pan, place the bay leaves on top, and pour the egg-milk mixture over it. Bake for 30 minutes until the custard on top has set. **South African chutney is sweeter than Indian; you can fudge it by combining duck sauce and apricot jam. 1. Preheat oven to 350F. Butter an 8″ square pan or 9″ pie pan. Sift flour, baking soda, and salt and set aside. 2. Beat egg and sugar together well, and add the jam. Melt butter, add vinegar and milk, and add alternately to egg mixture with sifted dry ingredients. 3. Pour into the prepared pan and bake covered loosely with foil for 45-60 minutes. 4. Combine sauce ingredients in a saucepan and bring to a boil. Pour the sauce over the pudding immediately after it comes out of the oven. Serve warm with custard, cream or ice-cream. How interesting! I haven’t heard of either of these, but would love to try them sometime! I feel like I’ve heard of Bobotie but never really knew what it was. Looks good! Thank you so much for sharing this… so interesting! I’ve never had SA cuisine… I can’t wait to give it a go! We did some SA food, including Bobotie, last summer as a virtual visit to SA wine making regions. The dish was one of the most interesting I had ever made. I loved the Indian seasonings with the lamb in the version we made. You SA table reminded me of the post I put together on the country, winemaking history and a bit about the food. Great minds! These are two of South Africa’s great winter feel good foods, as a chef i have tried many varieties of both these dishes and i found that if you are not a huge fan of spicy dishes then accompany your biboti with tatziki to melow out the heat of the dish, it works well and does not take anything away from this great dish. For the Chocolate lovers malva pudding can also be made into a chocolate version and there is nothing better than indulging in a soft moist chocolate malva pudding and cardomom custard after your meal.